Used for commercial, residential, and industrial buildings standing seam metal roofs are a versatile roofing option that offers building owners a number of advantages like cost savings, durability, and a wide variety of design options. Standing seam metal roofing systems are one of the many roofing options available to building owners. Typically, they are installed vertically and run from eave to ridge. Standing seam systems feature a raised interlocking seam that connects adjoining panels together. Standing seam systems are also installed with hidden clips and fasteners. These hidden clips and fasteners mean no unsightly exposed fasteners, which are more prone to result in the potential of leaks. Another advantage of this type of roofing system is its aesthetics. Standing seam metal roofs come in many styles and colors with a lot of design options available. This means that building owners can find the perfect style to match their building. There are two main types of standing seam metal roofing panels available, symmetrical and asymmetrical panels. Symmetrical systems, like the 138T and 238T roofing systems, are industry leading with significant initial and long-term savings. These savings stem, in part, from factors like labor savings, the reduced chance of damage from leaks, and ease of future repairs. The symmetrical panel seam design holds a fixed clip inside a fold at the top of the panel seam, so the sealant in the cap is in full continuous contact with the top of the panel seam with no interruptions. Many traditional asymmetrical standing seam panels have an interruption in the sealant at each clip location. Watertight seams lead to less maintenance, headaches, and reduced potential for leaks throughout the life of the roofing system. Additionally, asymmetrical panels must be installed from one end of the building to the other in one by one sequence. However, symmetrical panels can be installed from any point on the roof. Installers can also skip over penetrations and come back to them later or even have top installers work on difficult details while the rest of the crew continues sheeting the roof. These two labor-saving advantages can greatly reduce completion time and also offer a higher quality roof system. Symmetrical panels also have less scrap and reduced costs than asymmetrical panels because installers can use the drop cut off of one panel on the opposite side of the roof plane. Symmetrical standing seam panels are also the best option to guarantee ease of future repairs, remodels, and additions. Because a Symmetrical standing seam system does not have a male and female connection, the seams are mirror images of each other, and a separate seam cap covers the Symmetrical seams. This panel design allows for the easy removal and replacement of individual panels. 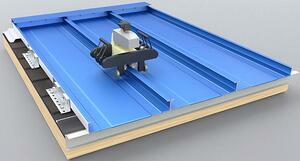 In fact, an un-seaming machine makes the process of replacing a symmetrical standing seam panel easy. The machine walks the panel and opens the cap back to its original shape, leaving the panel undamaged. Once the cap is removed, panels can be easily removed and replaced or reinstalled. You can see an un-seaming machine in action in the video below. Standing seam metal roofs offer building owners all the advantages of a metal roof with a wide range of design options to chose from. Our eBook Need a New Roof? How Building Owners Reduce Cost with a Metal Roof explores the roofing options available to building owners including standing seam roofing systems. Follow the link below to download your copy of the Need a New Roof eBook.